Craft fairs – Nice dress! Thanks, I made it!! The holidays are fast approaching and along with organizing and sewing for Designin’ December, I have been asked and have decided to make a few Rosie© Bags as gifts. I have a few cut out and I’ll be slipping the finished Bags on here as they get done, so you can have a look at them too! My first request was for one exactly the same as the one I made for my sister, with a lighter coloured lining though – if I had it. After all, I try to use stash and repurposed fabrics and supplies so sometimes the colour choices, etc. are not available! But I found enough for this bag, and maybe even one more! My pieces are cut and interfaced properly. Well … Long time no blog! It has been a whirlwind couple of weeks, starting with the Craft Fair. The top sellers for me seemed to be the infinity scarves and secondly the kitchen items. I had my business cards there too as I am willing to make up an item, personalized, from scratch, as indicated by the blue fleece jacket, for anyone. A note to self: when someone says “craft fair” check if you should bring your own small table. I should have known! But since it was in a private home, I assumed there would be lots of space and somewhere to set up. Well there was, but the poor Host was apologizing that she had so many vendors, she pretty much ran out of tables and space! I could have helped her out by bringing my own table at least! That being said she was very generous with her home and her coffee and snacks too! It was a happy, friendly crowd and a great day! 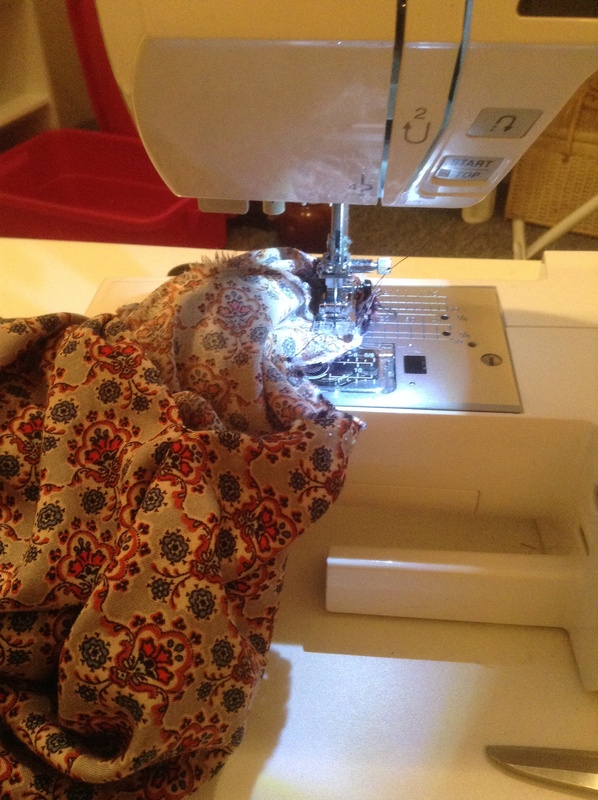 Now since I was busy sewing for the craft fair for two whole weeks, after full days at work, I did not do any of my regular exercise routines and as a result, as I should have known, my back went out this last weekend! Here I am trying to finish off some sewing projects and then get ready for Christmas and I have lost one weekend – so far – not being able to do anything comfortably, except stand. A few people at my office have asked if I have any infinity scarves left over – I do – and if so bring them in. They would love to buy one. A couple have also asked if I could make one in the blue material or the animal print for them – well I would love to!… When my back can bend again! Oh so aggravating! Anyway, here are some directions on how to make an infinity scarf – basically a large unstuffed doughnut (excuse my Canadian spelling!). 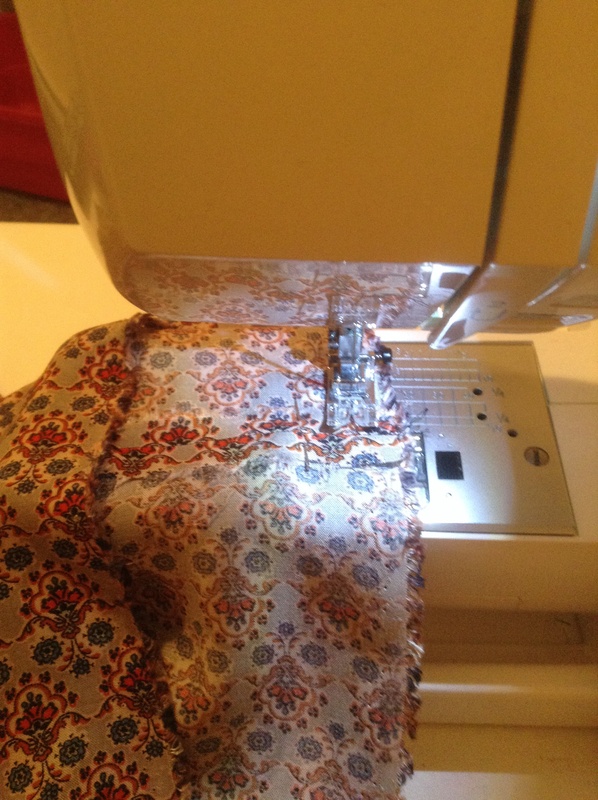 Cut one strip of fabric across the full 60″ width, make it 25″ wide. 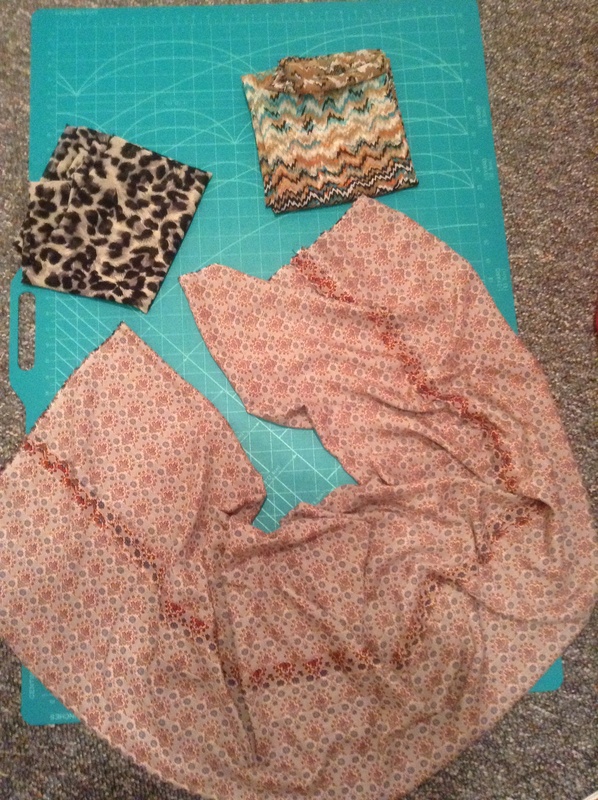 Fold fabric in half, with RIGHT sides of fabric facing each other and matching long cut edges. Pin together that long edge. Stitch along the long edge with a ½” seam. Press seam flat to blend stitches; press seam open. Now trust me… I had to just DO IT and not think about it! 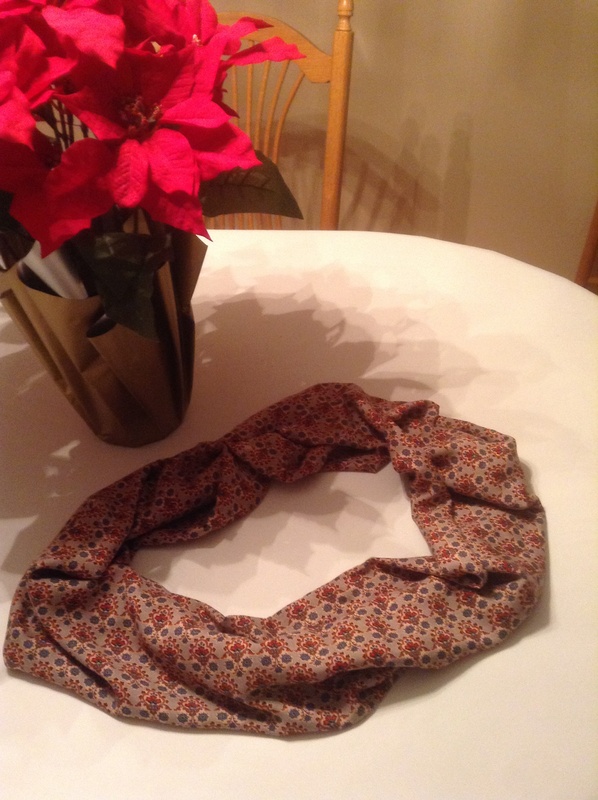 Turn scarf RIGHT side out – just put your hand in and grab the end and pull it through! Open short ends of scarf. Place short ends with RIGHT sides together, lining up cut edges and the one seam end. Pin together about half way around to start. Stitch short ends together with a ½” seam, as far as you can go, leaving a small opening (It will be hand sewn later.). 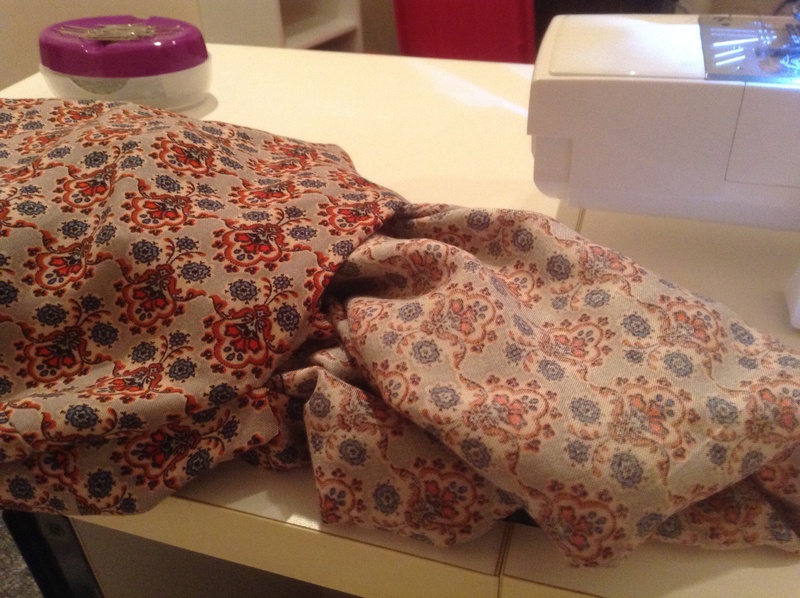 It helps to use the free arm on your sewing machine and let the one short end wrap around there to start. 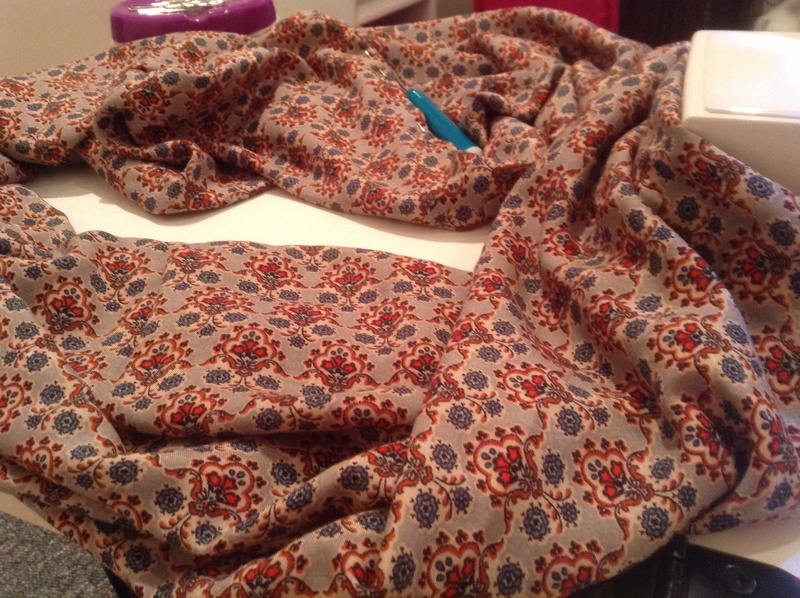 Even before taking my scarf off my machine, I shoved everything inside the hole to turn it right side out. My bad? Anyway, shove everything inside the hole. Shake it out. Slip stitch the opening closed. It is difficult to see the hole but it is beside my blue seam ripper. Press seams flat. And you are DONE! And looking lovely might I add! So I am imaging a busy couple of weeks/weekends ahead. A friend has invited my sister and me to bring “our stuff” to her… let’s call it a “neighbourhood craft fair”. I think she has rounded up about 15 crafters. I’m not sure about my sister, but it is the first such thing for me. I’m more used to someone asking me to do some sewing for them for a fee, whether a small mending job or sewing together a whole garment. I am looking forward to it and getting very excited! I had planned on finishing off my black Melton pea coat in the next week, but that has to be pushed aside for now. I must get “my stuff” in order! a silky no sleeve top – by the time I get to that one it will be summer and I can actually wear it! and a lovely silky suit jacket for the day job. Back to the craft fair! HELP!! I already have made a couple of light hoodies, a couple of dresses (she asked if I had clothes to display or sell) and some kitchen sets (pot holders, tea cozies, hanging towels). What else should I make… any ideas for something quick and easy? Doggie coats? 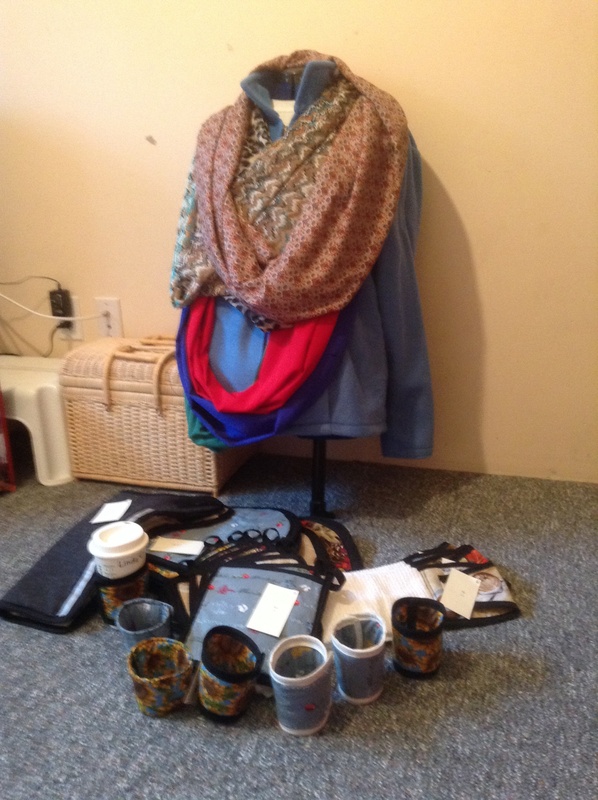 What about infinity scarves – the newest thing! Baby booties? Any ideas anyone? I would love to hear any suggestions you may have!